This week leading up to November 11 – with the 11:11 ‘Twin Pillars’ energy in high flow – is a beautiful opportunity for deeper release, resolution and healing. We’ll share a visualization practice below in the theme of rose-gold light, which is approaching a pinnacle of its frequency….and is being ‘ushered in’ and enhanced by the vibration of the alignments of Venus, Sun and Moon throughout the next week, then ‘grounding in’ during the window of 11:11 to 22:11, which we’ll speak of in the next post. Star family have a particular focus on realigning/relighting an ancient, misused vortex point on the planet on the 11:11, with which the Venusians (and many of us in our Venusian soul aspects) are closely connected, and the message of this realignment of energies first ‘visualized’ here on the full moon of October 16. Full Moon, October 16, 2016, with orb ‘hanging’ from a tree branch. Through a slight haze, the moon was ringed in a peachy rose halo, with a blue-green orb appearing to its upper left, also with a soft rose rim around it. 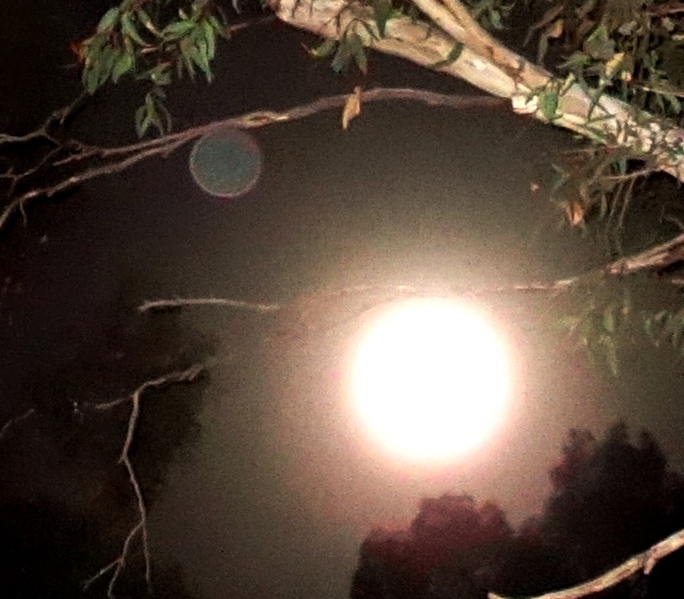 Both the moon and the orb held an identical position (twinned energy), like lamps hanging from the branches of the tree in the foreground….a beautiful symbolic representation of Lights shining forth from the Tree of Source/Tree of Life. The blue-green orb is here a symbol for our blue-green planet Earth, being wrapped in golden rose Light streaming through the alignment of the ‘lunar portal’ (in higher dimensions). 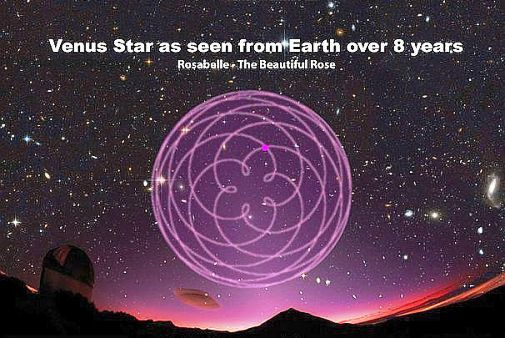 And rose is the spiral of Love and Life through the sacred geometric harmony, which can be seen in the ‘Venus Rose’ pattern formed by the orbit of Venus over every 8 year period as viewed from Earth. The flower of 5 petals (5-point star) within the 8 = 13, on one level the number of ‘Divine Feminine’ expression of Source. 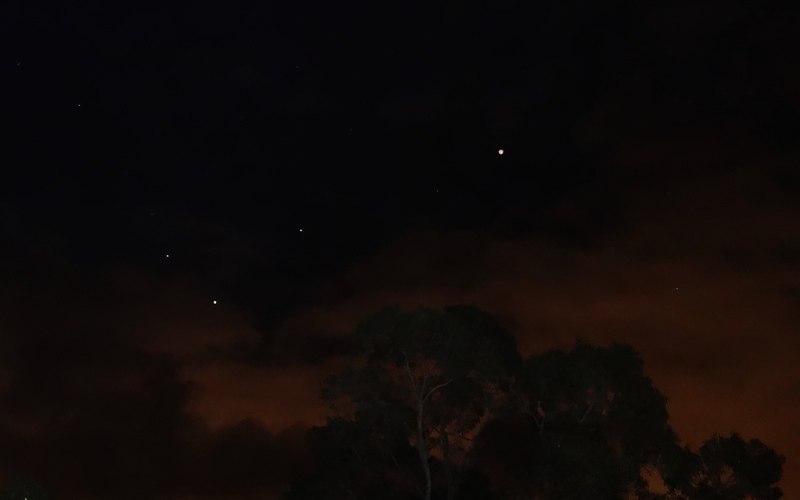 With this energy aligning toward the 11:11 Gate, 9 days after the full moon, Venus was very bright in the night sky, and two lightships flashed into view, evenly spaced at a specific angle…making 3 lights in alignment, representing 3 Flames (Venus is the ‘light’ at the lower left, under a pair of stars, with the two ships above to the upper right). 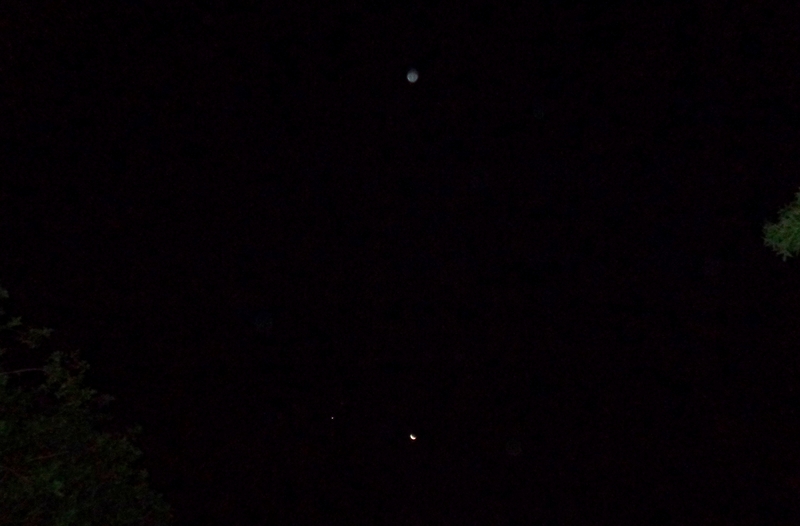 Two small lightships in alignment with Venus (the light at lower left), October 25, 2016. In this photo, the middle lightship came from the Meri’Ashar (with Ashura on board in his 5D form Arnap), and the uppermost ship was also brought down from a large ship (by one of our brothers, Ashira). Ashira’s ship recloaked, and Arnap stayed visible a few moments more. Last night, November 3, Venus had close company with the new crescent Moon waxing toward first quarter. 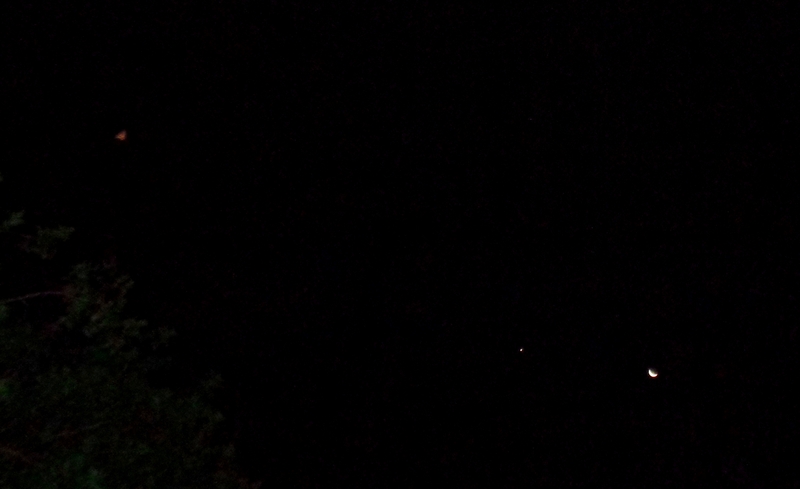 An orb (of merged soul energies who are guiding and overviewing the 11:11 focus/task) appeared in the photo below, directly above the Moon and Venus. Orb above Moon & Venus, November 3, 2016. Within their protective overlighting, two beautiful ‘rosy’ Venusian ships came through. 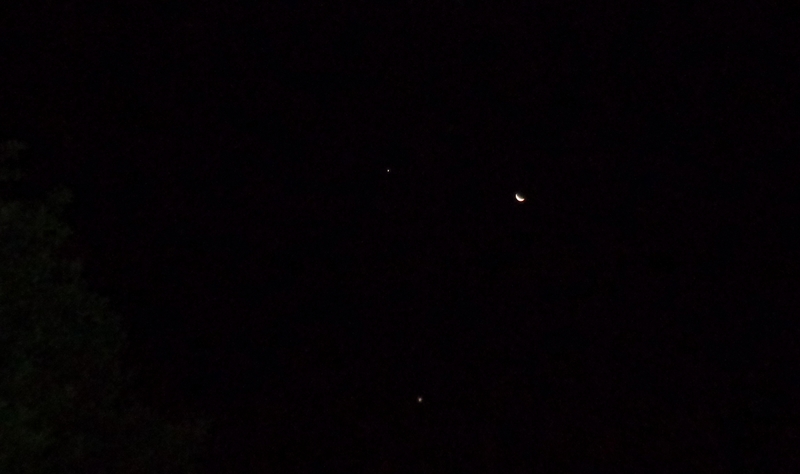 The first, a sleek triangular ship flew in from the south toward Venus & the Moon. 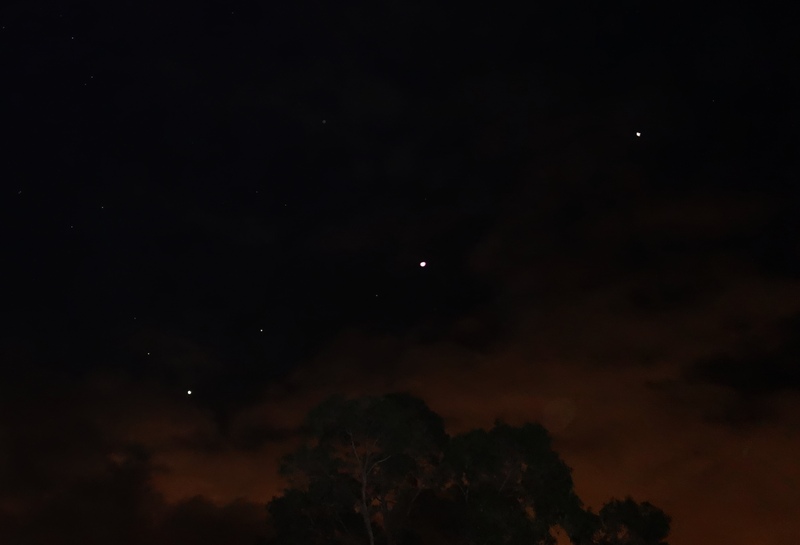 Venusian ‘rose triangle’ ship flies toward Venus & the Moon, November 3, 2016. The second ship flew through the crescent of the Moon itself (higher dimensional lunar portal), and is a Hathorian ship of blended rose and gold light. As you look at these photos and tune (whether consciously or subconsciously) to the array of Light coming through them, feel how the Venusian energies are building and in focus up to the zenith of the 11:11 Rose-Gold Gate, in this lunar cycle at the mid-point between first quarter and full. 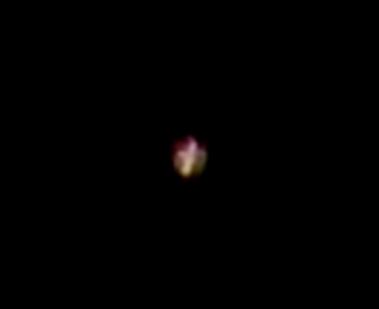 Hathors’ ship of rose-gold (peach) light, November 3, 2016. The Hathors are masters of sound-light weaving, and will gift the upcoming vortex realignment with a specific anchoring weave around the ‘gate’, so Angels, Hathors and those helping in human form will weave together, with a guard of Lion Beings ringed around them, holding the tone. Though we’re not able to say where this gate is right now, any of you reading this who wish to take part, dear friends and star brothers & sisters ‘on the ground’, holding your focus to visualizing rose-gold light – feeling it stream to and through you from the Source – and seeing/feeling/intending that it fills the planetary torus field (magnetosphere, in the physical level) will contribute beautifully and help to strengthen this energy. The visualization below can also be used whenever you like, but has a particular high attunement during the coming week, for releasing distorted/heavy energies in your own ‘personal’ field into rose-gold light. Sit comfortably, relax and breathe deeply and slowly into your heart centre-point (heart chakra). Envision yourself within a pillar of light from the centre of Source to the crystal heart-core of Gaia, at the centre of the Earth. See a rose-gold ball of light in your heart centre (or an actual rose of that colour if you prefer). Feel its warmth, deeply, inside your heart. Feel the Divine Love that you are, at your core, in your innermost Flame, in your soul spark. Now let that warmth, love, and divinity expand softly all around you so that it fills your torus field, your aura, completely. Feel your whole BEing immersed in the rose-gold light of warm Divine Love. Keep breathing deeply, relax wholly. Then call forth any distorted, unsettled or tight energy ‘bundles’ in your energy field. 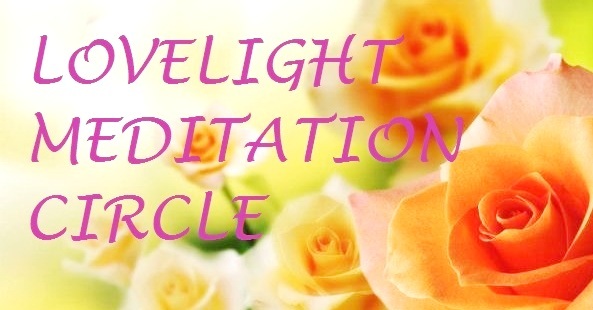 They may be obvious to you – energies you’re already consciously aware of and ‘working on’, or they may be hidden from view – veiled in the subconscious. Now is the moment for all energies within your field not aligned to the highest Light, Love and Life to come forward. They may appear visually to you, large or tiny, faint grey to dense black, depending on the ‘hold’ and ‘charge’ of the energy. Or they may just be feelings connected with relationships, work, health, society, collective fears and so on. Be peaceful, release those bundles now into the rose-gold light with your blessing and love, and see them transmute and dissolve into that light. Relax and bathe in the rose-gold, feel your true inner self’s loving energy, the Love that it springs from. 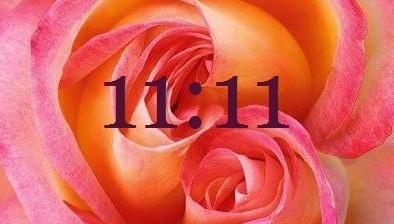 Do this as often up to the 11:11 as you feel to, for clearing and aligning. Thank your Inner Divine, thank Source, and you guiding Lights. 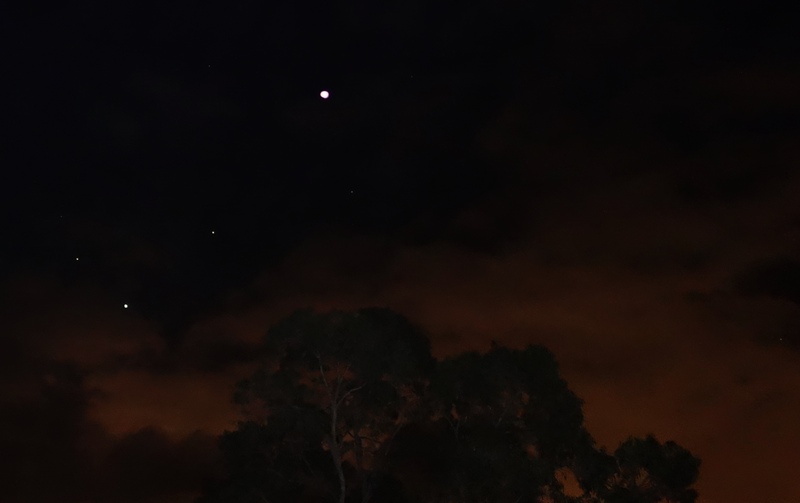 We’d like to share one more photo from November 3, a small orb or ship (sometimes they shift from one to another) that appeared in this photo, just below the Moon & Venus. Small orb/ship beneath Moon and Venus, November 3, 2016. 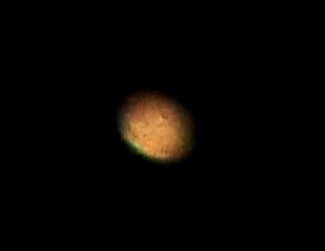 On enlarging this orb, there is a cross inside it, and this is the energy of the Golden Flame of the Christ-light (the ‘child’ energy rebirthing) through the Rose.